Adrienne Schipperus has enjoyed an active freelance career as a professional harpist in Calgary for the past 20 years. Adrienne began studying harp through private instruction in both Calgary and Edmonton. 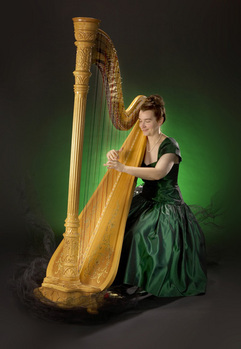 Upon completion of her studies at the University of Alberta, Adrienne went on to pursue advanced studies in harp performance at the University of Arizona. Under the instruction of Dr. McLaughlin, a world renowned harpist, Adrienne specialized in harp performance involving a diveristy of musical styles, techniques and musical arrangements. While studying at the University of Arizona, Adrienne performed as part of a multi-harp ensemble named HarpFusion. As part of this ensemble she toured in the United States and overseas playing for a variety of audiences. She has also created many musical arrangements suitable for Harp Ensemble. During her time in Arizona Adrienne also frequently played at the prestigous Loews Ventana Canyon Resort in the dining room. Since graduating from the University of Arizona School of Music with a Master's Degree in Harp Performance Adrienne has performed extensively in and around Calgary at a wide range of events such as wedding ceremonies, receptions, anniversaries, corporate events and Christmas Parties. For many years Adrienne was the resident harpist at the Delta Bow Valley's Sunday Brunch. While Adrienne does concentrate her freelance work within Calgary she also plays at functions throughout Southern Alberta including, Okotoks, High River, Cochrane, Kananaskis, Canmore and Banff. Venues have ranged from churches, hotels, backyards, golf courses and even campgrounds. Adrienne performs on a full-size, classical pedal harp which allows her to play a broad range of musical styles. Her extensive repertoire includes classical, popular, contemporary, Celtic and Jewish music, as well as many of her own arrangements. As part of her services Adrienne enjoys the challenge of finding and creating new repertoire that is relevant to her clients.